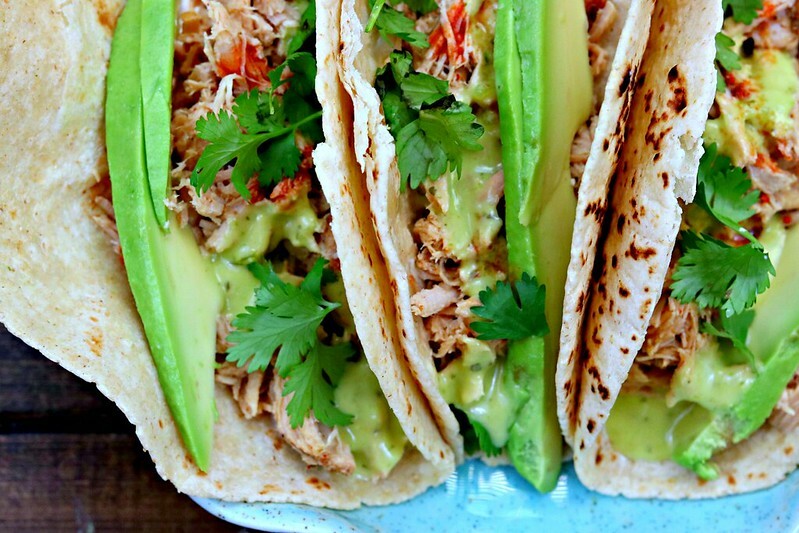 Pulled pork slow cooked with spices, beer, and citrus juice pairs perfectly with creamy avocado and salsa for an amazing taco! I’ve been working, slowly but surely, on updating my older posts. By older I mean…2011-2014, at least. That’s a lot of posts, which is why it’s a slow-going process. You know, trying to balance making and posting new recipes, and updating the old ones. And if we’re being honest here, it’s a struggle to get anything at all posted lately, so that balance and really gets thrown off by that – ha! You all are the best for hanging in there while I get it together over here. Who knew that my life being turned upside down by a job change would take me going on 9 months now, to still be trying to figure out some work-life balance. I’m not really complaining though. I love my new job, it’s just changed my routine and I’m still sorting out how to make all the pieces fit together like they used to. It’s a process! My crock-pot and more recently, my Instant Pot, have been life savers on many nights. At least once a week, sometimes more. I first made this taco in 2011, in a dutch oven. I loved it so much then, but it was in desperate need of an updated photo. That, and I also started making it in my slow cooker, so new directions have also been added!! Pulled pork is one of those things that is just meant for the crock-pot. I mean, it turns out great in a dutch oven, or probably even in the Instant Pot, but…I just feel like crock-pots were made to make pulled meats. Ya know what I mean?? I am not a beer drinker myself, but when a recipe calls for it, I have no problems using it. However, if you prefer not to cook with it, white wine or chicken broth can be used in it’s place for this recipe. I used to get annoyed when I was going to make a slow cooker recipe, but had to first sear and brown the meat. I’d think to myself, “I thought I was just supposed to dump all the stuff in and turn it on and go? ?” Well, I’ve learned over the years, that for some recipes that is totally the case, but for others – like this one – you want to sear the meat, for multiple reasons. One reason is that it sears all those yummy seasonings right on there – makes a sort of crust around it. But even more importantly, that crust helps to keep the moisture in. And when you have meat sitting in a slow cooker for 6-8 hours, believe me when I say that you don’t want to skip that step and wind up with dried out meat. Nobody wants that. Allow yourself the extra 5 or 10 minutes to do the searing. Sear the meat, deglaze the pan, put it all in the crock, and let that baby go on low for 6-8 hours. 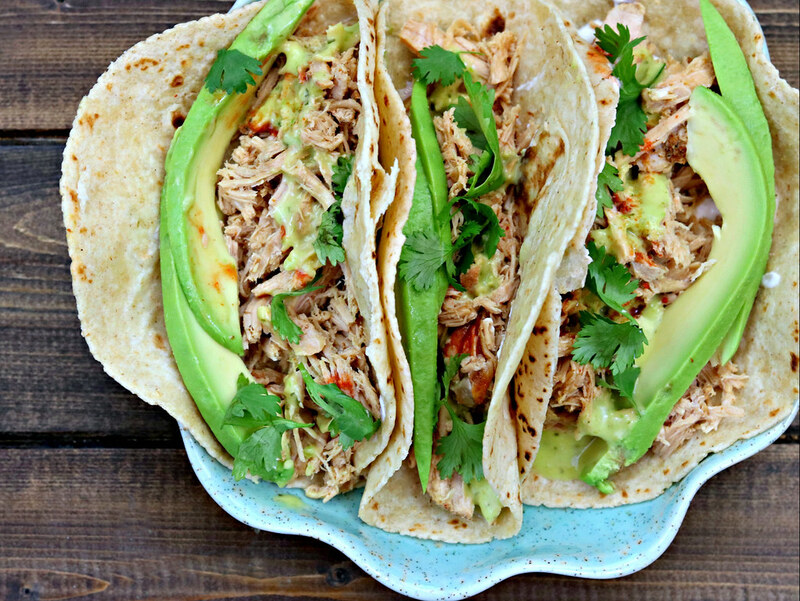 When you get home, it will practically shred itself when you stick a fork in it, and then you put your tacos together and enjoy a delicious meal that took you very minimal hands-on time. What more could you hope for??? 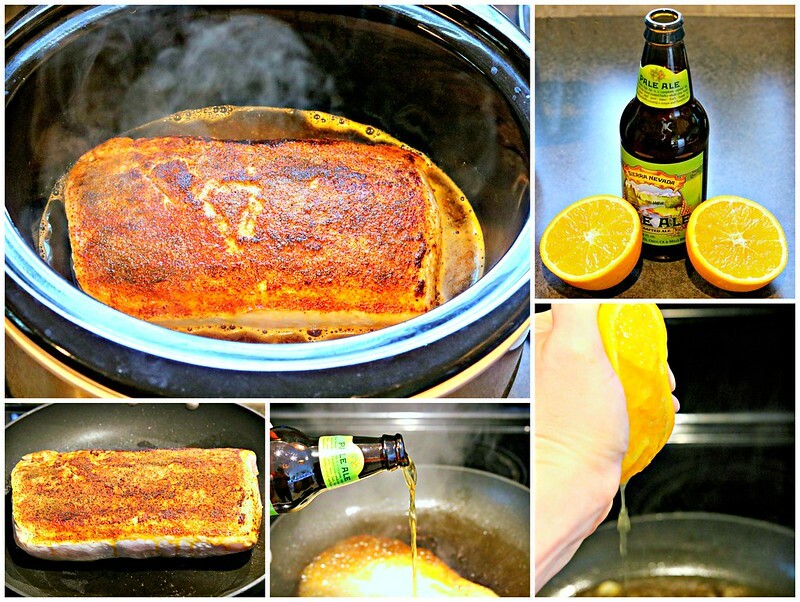 I love the citrus flavor from the orange juice and the beer, and with the spices, the hot sauce(s) and the creaminess of the avocado and sour cream, it’s the perfect blend of sweet, heat, and creaminess. And of course, it’s a taco form so…that automatically makes it a favorite around here. But, another great thing about pulled pork is it’s versatility. I mean…tacos, taquitos, sliders, salad, baked potatoes, nachos…is there anything you can’t put it on?? Me thinks not, my friends. Me. Thinks. Not. And just for grins (or cringes?? ), I have to share with you the 2011 picture versus the 2018 picture….drum roll, please…. Now, the reason you’re here – the recipe! I’ve included the original dutch oven version, along with slow cooker instructions. So you can choose your preferred method. And, I may just come back and update with Instant Pot directions, too, once I try it that way! Cut the pork loin into 3 or 4 big chunks, leaving any bit of fat intact. Combine salt and rest of spices in a small bowl. Spread spice mixture onto a plate. Evenly coat the pork pieces on all sides with the dry rub. Heat oil in a dutch oven or heavy-bottomed pot over medium-high heat. Add in the seasoned pork pieces, and sear all sides until browned (about 1 minute per side). Remove pork from the dutch oven. Pour in the beer, wine or chicken stock and scrape the bottom of the dutch oven to deglaze and release the browned bits of pork. Add in the orange juice, and bring mixture to a boil. Add in the seared pork. Cover dutch oven and place in oven for 1/2 hour. Remove lid, turn pork pieces over, and return to oven–uncovered–for about 1 1/2 hours, or until the pork is fork-tender, turning the pork pieces 1-2 times during the cooking process. Shred pork right into the sauce using two forks. Toss the pulled pork with the reduced sauce. Warm tortillas and top with sour cream, pork, avocados, cilantro and hot sauces), and/or any other toppings of your choice! Heat oil in a large skillet over medium-high heat. Add the seasoned pork , and sear all sides until browned (about 2-3 minutes per side). 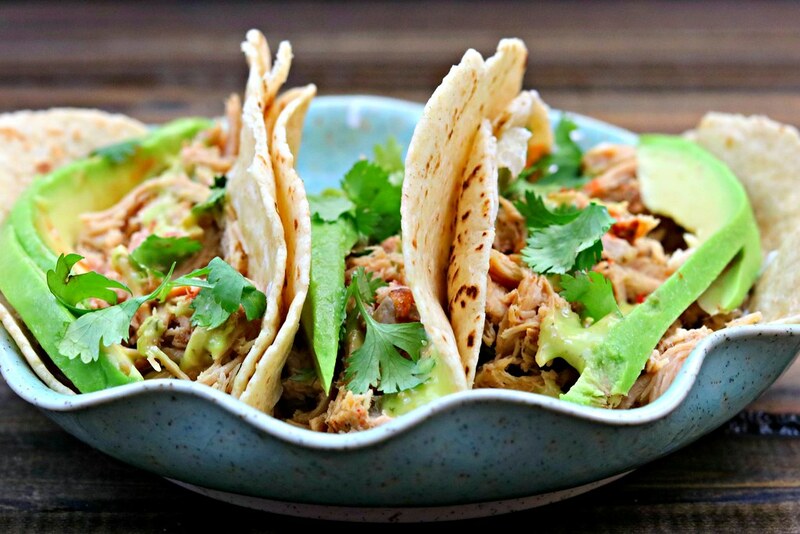 Remove pork from skillet and place in the slow cooker. Pour the beer, wine or chicken stock into the skillet and scrape the bottom to deglaze and release the browned bits of pork. Add in the orange juice, and bring mixture to a boil. Pour the sauce over the pork in the slow cooker, cover and cook on low for 6-8 hours, or on high for 3-4 hours.